We conduct a core product inventory every quarter for our bark and pumice stockpiles to keep our bookkeeping updated. Our inventory collection methods consisted of simply guessing the volume of each pile (highly inaccurate) or having our loader operator move 5 yards of product at a time (extremely time consuming, difficult, and dangerous). In the end, our volume collecting methods were costing the company a lot of time and money. After contacting AirGon for help, we acquired the AirGon Mapping Suite. With the AirGon Mapping Suite we are able to complete our inventory collection from start to finish in one hour. We first plan our mission and ensure we have everything ready for a successful flight. Ground control placement spots were chosen based upon AirGon’s recommendation. For ground control, we made 2’ diameter steel circles which we welded handles onto and painted black with white X’s. When we prepare to fly, we simply place them out on their designated spots marked with paint. Next, we fly our DJI Phantom 4 over the preplanned area. We then bring our collected images into the PhotoScan software, where we process the collected images to create our point cloud. Once complete, the point cloud is loaded into the LP360 software for data analysis. With a single click within a pile, our stockpile toes are generated automatically. We then run the volumetric analysis task which quickly and accurately calculates our inventory volumes. The AirGon Mapping Suite has saved us lots of time and lots of money! 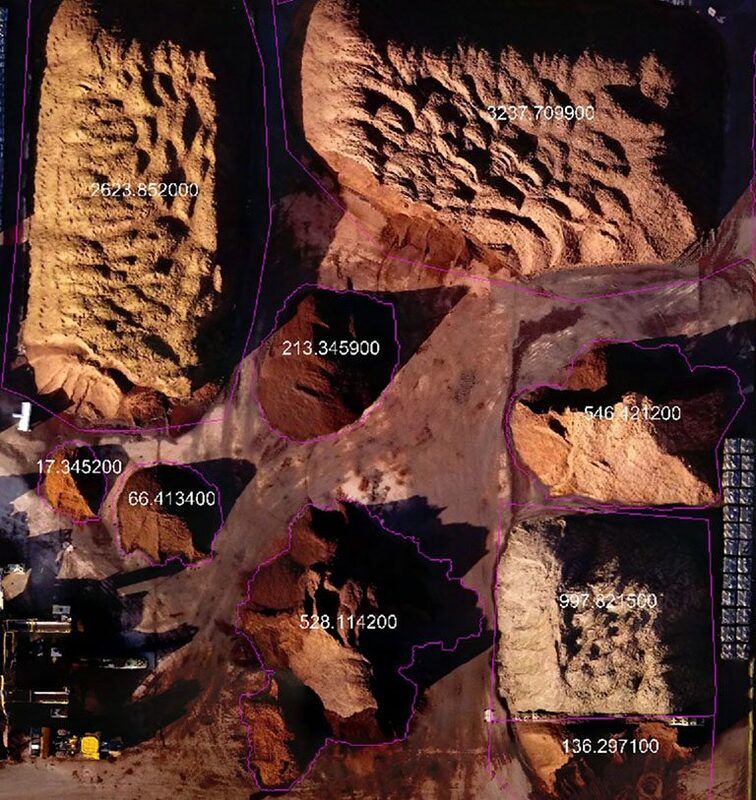 Though our stockpiles consist of varying materials, we have never experienced an issue using this method. In fact, using the AirGon Mapping Suite has made collecting inventory easier and much more efficient.